1964, Starring Dennis O'Keefe, Kasey Rogers, Al Ruscio, Linda Bennett. Directed by Lawrence Matlansky. The mid-1960s were a crucial time for English-Canadian film, even though only a few actual films were made. After the initial Toronto-based attempts to kick-start feature film industry fizzled out in 1962, industry players put away their cameras and busied themselves lobbying for government funding. Until the taxpayer's money started flowing in 1969, only a few scattered exploitation films were made for English audiences during this time. Montreal's The Playgirl Killer was probably the most popular film to emerge, but from director Lawrence Matlansky and Corona Productions of Edmonton came another, equally important slice of sleaze. Naked Flame aimed to capture the imaginations of the public by mixing exploitation and courtroom drama with a subject ripped from the day's headlines. Naked Flame is a based on the true story of the Doukhobors, a religious group of Russian anarchist farmers that emigrated to Western Canada at the beginning of the 20th century. As they were against the principles of land ownership or birth and death records, the Doukhobors soon found themselves in conflict with the Canadian government. 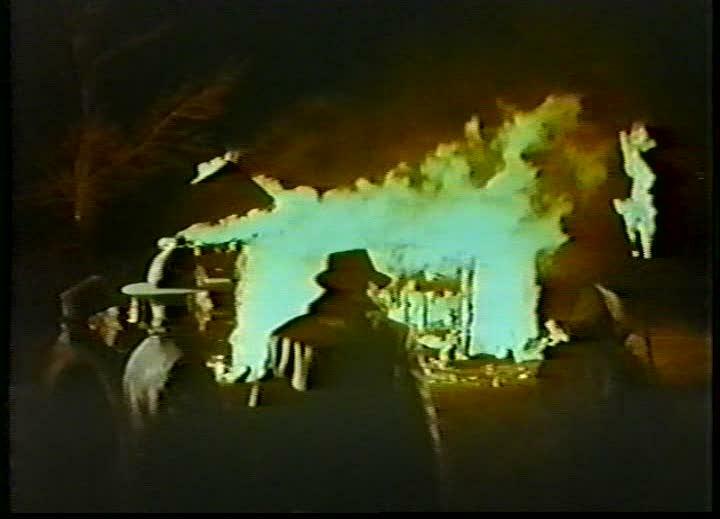 An extreme Doukhobor faction known as the Sons of Freedom (or Freedomites) asserted their beliefs by protesting, naked, and burning down government buildings. Supposedly, they believed they could cleanse the world of evil with dynamite. Naked Flame takes place in Little Creek, a mining town in Northern Alberta that is ripped apart when a Doukhobor girl falls in love with a good Canadian boy. Walter Sorkin (capably played by Al Ruscio) is a Freedomite who uses fear and intimidation to bully the town, but finds himself in conflict with Dominion Mining Company investigator Paul Ashley (Dennis O'Keefe in his final role). Mine foreman Mr. McCauley is having trouble with the Doukhobors, who keep trying to burn down his operation. It's all because his son Bob has fallen in love with Cathy, a Doukhobor who was supposed to be wedded to the villainous Sorkin. Although Cathy's father now regrets setting up the arranged marriage, Sorkin's unshakable belief that young Bob is stealing his wife makes his Zippo finger awful itchy. Sorkin tells McCauley that if his son doesn't stay away from Cathy, he can expect more trouble. Flaming naked trouble. although Bob told his father that he swore off dating Russian anarchists, Sorkin leads McCauley to where the young lovers are parked at Make-Out Cliff. Angered that he is jeopardizing the whole town's safety, dad drags son out of the car and begins to administer a beating. Unfortunately, Bob was pulled out so quickly that he didn't have time to put on the parking break, and both father and son pause to watch the car roll down the cliff, knocking over Cathy and almost sending her to her death as well. On arrival, Paul is immediately on the trail of Sorkin. See, he's familiar with this problem before he moved away from Little Creek, he had been engaged to Elena, another Doukhobor girl (and Sorkin's niece to boot). The relationship crumbled when Paul convicted her brother for arson by testifying against him in court. Because her brother denies that he set the fire, Elena thinks that Paul maliciously lied on the witness stand. In fact, it was her brother who misled the jury in an attempt to avoid a conviction. Paul stops by a local eatery just in time to catch the slimy Freedomite coming on to Cathy again. A fight erupts between Bob and Sorkin, and Paul throws the firebug out of the joint. Thinking that a commitment might deter the competition, Bob uses this awkward time to propose marriage. Not a good idea Paul awakens that night to find his old flame Elena and four or five naked Doukhobor girls outside his cabin with torches. Elena is still harbouring a grudge against Paul, and although he can't convince her of the truth, Paul does manage to convince her to abort the arson attempt. Disappointed with Cathy's impending marriage and Elena's failure, Sorkin gets rip snortin' drunk and grabs his gasoline can. Although he doesn't bother to undress, he sets fire to Cathy's log cabin, smoking her out. After a short chase, Sorkin finally catches, rapes and then kills her. Unsure of what to do now, Sorkin extorts $2000 from the foreman with the intention of leaving town. But it's too late the entire population of Little Creek watches Cathy's lifeless body being carried into the Mountie station. Once again showing a knack for bad timing, Bob loudly announces to a hundred witnesses his intentions to kill whoever did this to his fiancé. Suddenly, the film shifts gears and becomes a murder mystery. A POV shot obscures the identity of the person who goes to Sorkin's house to blow him away with a shotgun. 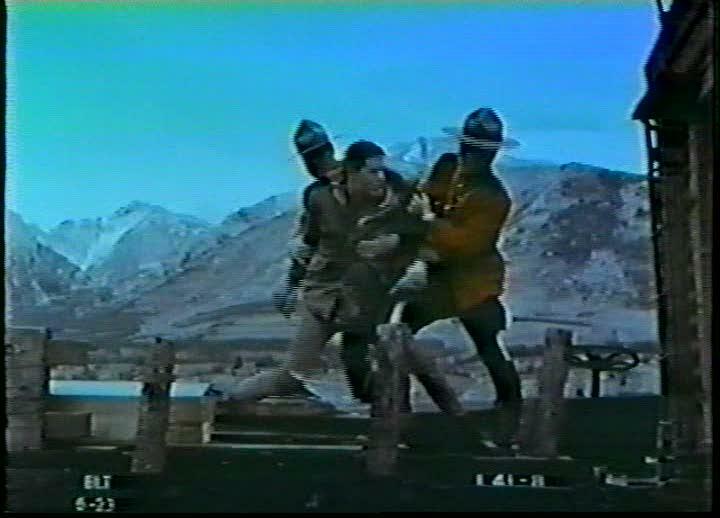 Of course, Bob immediately comes under suspicion, and is caught by the Mounties after a chase over CP Rail boxcars. Paul decides to defend the poor guy in court, but in the ensuing trial, the damning evidence starts mounting up. Bob's shotgun is confirmed as the murder weapon, and no one can corroborate Bob's claims that he went for a drive by himself that night. Paul even starts questioning his client's innocence until Bob suddenly remembers that an old Indian guide can place him 80 miles away at the time of the murder... only Bob can't remember his name! Naked Flame is a very unique Canuxploitation film. Although the film seems aimed at an American audience, it manages to tell a distinctly Canadian story to without reducing Canada to it's most stereotypical elements. For example, although the film reaches back to some of the identifiably "Canadian" elements of the silent-era North Woods dramas, it treats them much more realistically. As opposed to pillars of honesty and justice, here Mounties are nothing more than common police officers doing their job. The logging camps and mountainous Banff settings provide constant eye candy, but are never directly alluded to and do not play any direct role in the story. It's a Canadian film alright, but the early 20th century American romanticism of our country as a wooded paradise has been rightfully left behind. Not surprisingly, the Doukhobor cause does not get the same respectful treatment. Although the film misleadingly advertises itself as an expos, the purpose of the protests are wildly distorted, dropping all political aspects in favour of only on the most exploitable aspects of their rebellion. When Matlansky is through with it, Doukhobor defiance has been reduced to the vandalism of a vengeful, jealous man for personal gain. In fact, the only Doukhobors that seem to get undressed in this film are young, nubile girls, but that's to be expected this is a low budget cash-in. But suprisingly, it's also a fairly good low budget cash-in. 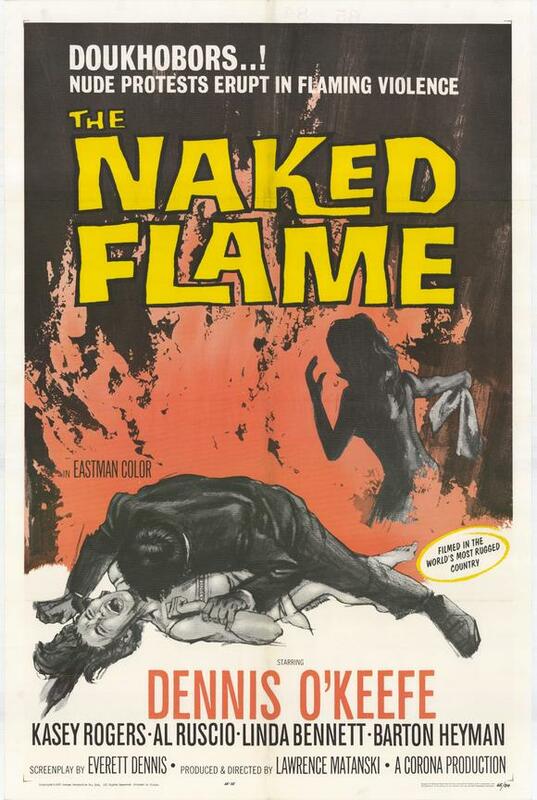 Although the film bogs down somewhat during the courtroom scenes, Naked Flame is for the most part an enjoyable mid-60s exploitation film entry that makes up for lackluster production values with above-average acting, melodramatic plotting, and a story you won't see anywhere else. Even the final plot twist comes unexpected and neatly ties up the film. 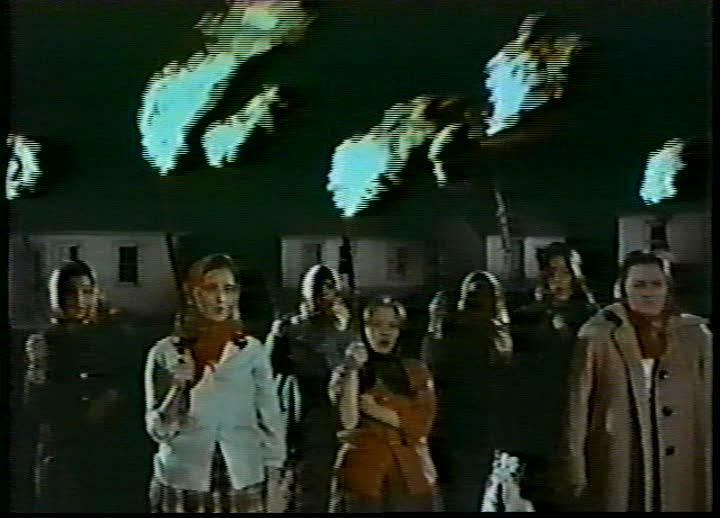 Like many Canadian films, Naked Flame went unreleased for several years, surfacing finally in 1970 when the Doukhobors were no longer commanding headlines. Like this film, the Doukhobors and the Sons of Freedom remain a forgotten piece of Canadian culture, even though they still exist today as recently as a few years ago, an elderly Doukhobor woman was arrested for removing her clothes allegedly burning down a public school in Vancouver. Quite frankly, this film could not and should not have been made in any other country. It's a truly Canadian film that exists outside any recognized canon. And because Naked Flame can still be considered a relevant exploitation film even 35 years after it was made, it remains essential viewing for Canuxploitation fans.